Today we will be taking a look at the best RV water hoses that are safe for drinking water, also called potable water. While that sounds like an easy task, there are a lot of different choices and water hoses have features, quality, and safety differences. I have spent a lot of money on crappy water hoses over the years that have ended up leaking, rotting, cracking, etc. For that reason, I won’t be comparing the most budget versions or ones that I have tried and thrown away because in my experience they’re budget for a reason. What you need to be on the lookout for when buying a hose to fill up your RV with is that it’s drinking water safe. If you find a hose that doesn’t mention that it’s safe for drinking water, you should assume that it’s not. The most important things we need to look at is if the hose is lead-free, phthalate free, and BPA free. Note that some hoses and fittings are advertised as lead safe, which is not the same as lead-free. I have written more about this fact in the FAQ. As always, you will find answers to the most common questions down in the Frequently Asked Questions. But now, let’s take a look at the products we will be comparing. Camco makes several different water hoses for drinking water, but this is the one I recommend. Even though it’s made out of PVC, it’s advertised as being lead-free, BPA free, phthalate free and not making the water taste like plastic. The hose is NSF certified and follows certain standards. The reason I chose this one over other Camco hoses is because of the strain-relief that has been put on it for better durability. It’s also thicker than other hoses. The thickness will make it more durable for dragging it over grass, gravel, and stones without having to worry too much about the wear and tear on it, at least not as quick as on a thinner hose. 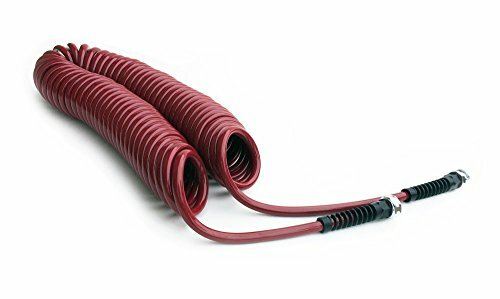 Camco Premium Drinking Water Hose comes in several lengths from 4 feet to 50 feet, all of them are ⅝” on the inside diameter. That’s great and gives you several options for how you want to use your hoses. I have been at campgrounds where a 4 feet hose for the city water connection has been enough surprisingly. Having a short hose is also great for when you need to rinse of your bike or feet quickly nearby the water source. Connecting several hoses is easy to do and I like having two shorter hoses instead of one long one because I never need the same length every time. There are two big reasons that I recommend this hose over some of the others, its safety and durability. It can take a maximum of 150 PSI and temperatures from -40°F to 165°F. Having a durable hose means one less thing to worry about. There are enough things that can go wrong surrounding the RV already, you don’t want to deal with a broken water hose when you’re 200 miles from the nearest camping store. It’s also very flexible compared to a PVC hose and kink-resistant. This will let you kink the hose when needed, but it won’t kink in that same place over and over. The ELEY Hose measures 5/8″ on the inside diameter and comes in different lengths starting at 25 feet all the way up to 200 feet. Even though it has the same inside diameter as other 5/8″ hoses, it has a special kind of fitting that is wider for better water flow when needed. If you prefer a coil hose, I recommend this one from Water Right. It’s a lead and phthalate free hose that stretches to get longer. It’s made out of FDA and NSF grade polyurethane materials and UV stabilized. With its 3/8″ inside diameter, it will be the lightest hose we’re looking at today with the smallest inside diameter. The great thing about a coil garden hose is that it becomes more portable than a regular hose. Not only weight-wise but also by automatically recoiling itself the user has one less job to do when putting it away. One negative thing is that you won’t get as much water pressure out of a coil hose with this inside diameter compared to a 5/8”. Having a portable hose is great if you’re often filling up the tank and want to be in and out of the filling station quickly. I have seen enough people wrestle hoses to know that a coil hose can be of great help when leaving. 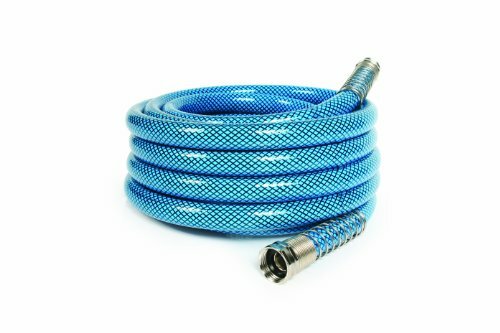 The Water Right Professional Coil Hose comes in 3 different lengths, from 25 feet to 75 feet in 6 different colors. Remember that you can always have two hoses and connect them together instead of having one really long one. All campgrounds are set up different and sometimes 5 feet is enough but the next campground requires 35 feet and you don’t want to be on the short end! This is another hose from Water Right but it’s not a coil model. 100% lead and BPA free. Made out of FDA and NSF approved polyurethane materials. What I think is great on this one is the strain relief solution on both ends, together with the fact that it has a 1/2” diameter. The strain relief will get in the way less during use compared to Camco’s solution above, and last longer. The polyurethane makes this hose flexible and it’s pretty lightweight (2.4 lbs @ 25 feet) for the material and size. If you have ever had to deal with a hose you know that having a lighter one is so much easier to pull and use. You shouldn’t have to use your muscles to get the hose where it needs to be. The Water Right 500 comes in 3 different lengths, from 25 feet to 75 feet. The fact that it’s 1/2” thick is something to take into consideration; it can be both a good and a bad thing depending on your intended use. Remember that the 5/8″ hoses are even thicker than 1/2″. Next up is the a hose from Teknor Apex. The model is called NeverKink so supposedly it shouldn’t kink at all. It’s made with FDA sanctioned materials but advertised as lead-safe which does not mean lead-free. The Teknor Apex NeverKink is 1/2” thick and comes in two lengths, 25 and 50 feet. The biggest reason this hose made the list was thanks to its ergonomic coupling. It’s made out of plastic though so I wouldn’t recommend it for full-timers. Having an easy to use coupling is a great feature and something you will come to appreciate too with regular use. It doesn’t hurt your fingers, and it also makes it easier to use for kids or adults that haven’t used a hose before to screw it on. I wish more companies would take into consideration how ergonomic their couplings are for these reasons. Last up is the Zero-G, also from Teknor Apex. What it does a lot better than every other hose we’ve looked at today is how portable it is. Its design and material makes it extremely flexible compared to other hoses. The Zero-G is drinking water safe and lead-free. This model is 25 feet and has a diameter of 1/2 inch. Due to how flexible it is, it comes in a very small container and you can store it in a small plastic bin. It doesn’t take up much space at all, and is very impressive for its length. I recently purchased one of these and I’ve been impressed with how easy it is to handle. 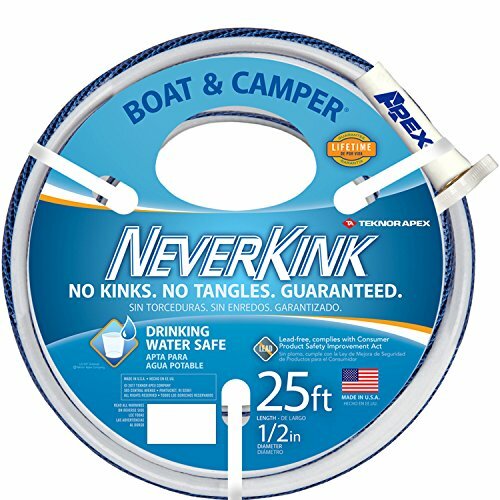 It doesn’t kink, and the hose goes where I want it to as it doesn’t “have its own life”. Another benefit with the Zero-G is how lightweight it is, weighing only 2 pounds. There is a big difference between a hose and a good hose and I believe it’s worth the money to get a good hose not to have to buy a new one every year. Something I have learned is that companies can advertise products as being lead-free if they contain very little lead. You might see people give hoses bad reviews for this but it’s legal so I understand why the companies do it. As I will answer in one of the questions below, how much you should spend on a hose should be based on how much you use it each year. If you only use it for that once-a-year family reunion, go with a cheaper one as long as it’s drinking water safe. It might kink, stink, and make your drink taste like plastic but you might have other priorities where you want to spend your camping money. Good: The Camco Premium Drinking Water Hose is a mostly safe hose that is durable thanks to its thickness but it falls short with its low-quality strain relief. Take care of it and it will take care of your drinking water. 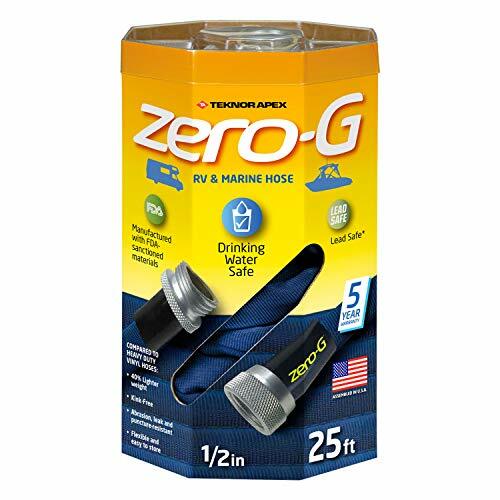 Better: Teknor Apex Zero-G is a great hose that is extremely flexible due to its material and design. If you need a hose that takes up very little space when stored, this is the one. Safe for drinking water, made in the USA, and with a 1/2 inch diameter. One of the best hoses on the market for RVers. Best: Water Right 500 Series High Flow Garden Hose is my choice for the best hose today. 1/2” diameter, light, made with FDA and NSF grade polyurethane and great strain reliefs. Thick enough to give you plenty of water. Flexible in all weather conditions which will be great for full-timers. What makes a hose safe to use for drinking water? When looking at what hose to buy the most important things to watch out for are if they’re lead-free, phthalate free, and BPA free. The reason being that these chemicals affect our bodies in a bad way and drinking water should never hurt your body. Even if you only use your RV water for showering or washing your hands, having a bunch of chemicals in the water is something to avoid. How long should the hose be? 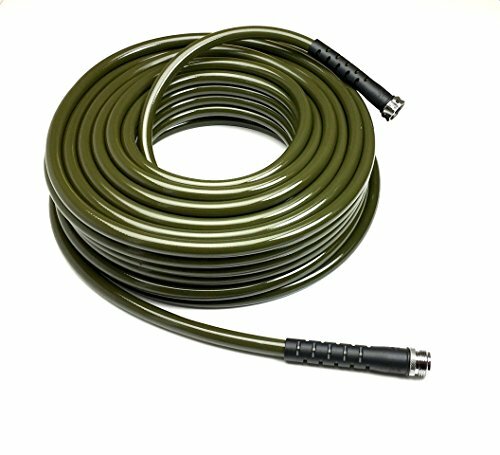 You will have to consider the length of the hose you buy based on where you’re planning on using it. If you’re at a campground or a fill-up station you should be pretty close to the water source and 25 feet should be enough. Some campgrounds are designed in a pretty dumb way though so 50 feet or more will be necessary. If you’re planning on filling up from a house you might want to go for a 50 feet hose or more. It’s good to consider this before purchasing so you don’t end up with a hose that’s too short or way too long for what you need. Buying two 25 feet hoses is also a way to do it. Potable water means that it’s safe to drink and use for food preparation. Is it really necessary to spend so much money on a hose? If you want a safe, durable, flexible, and high-quality material hose, you’ll have to pay a bit more than for a cheaper PVC hose. Like with a lot of other things, products made in the USA that are higher quality with better warranty will cost more. If you only go camping once a year, one from Camco like this one will do just fine. But if you’re an avid camper or live full time in your RV it’s worth spending a little bit more. Having your water hose break when you’re out camping can destroy a trip. Can’t I just use my garden hose? If you don’t remember purchasing a hose that was advertised as drinking water friendly, I wouldn’t recommend it. For the simple reason that you don’t know whether it’s safe or not. And if you’ve had it outside for a long time, who knows what’s inside of it now. Is there a difference between lead-free and lead safe? Here is the thing. If for example a brass fitting has extremely low levels of lead, a company can legally call it lead-free. This is the way it works in the United States at least. You might find reviews that call for outrage for a product that is advertised as lead-free while not 100% lead-free, but remember that they’re not doing anything illegal, just bending the truth. 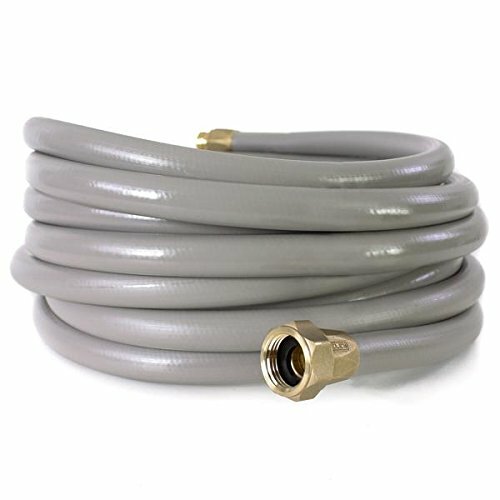 How do I take care of my water hose? When you have spent the money and purchased a good water hose, you might as well take good care of it to make sure it will stay safe from chemicals and last you a long time. Avoid the sun – If the hose has any kind of chemicals in it, the sun can increase the leaching of them into the water. If you’re at a campground hooked up to water through a hose that’s in the sun, it’s okay as long as you let the water run cool before using it. Let the water run through it before using it – A common practice while filling up RV’s is to let the water run through the water hose for 5-10 seconds before attaching it to the tank. An easy way to clean it out from dirt and chemicals. It will also taste more like plastic if the water has been sitting in the sun, based on my own experience. The way you store it – Throwing the water hose in the back of the truck or the storage compartment is an easy way to get rid of it quickly. This will not only make it easy for dirt to get into your hose but also most likely shorten its life due to the wear and tear. Don’t leave it out when you’re not using it. Ok, I got a safe hose and will take care of it. What now? Buying the hose is just part of the fun of filling up your RV. Now we have some other things to think about. Where are you getting the water from and how safe and clean is it? How much pressure are you getting? When connecting to city water, you want to be careful with the pressure to not break the plumbing in your RV. Water pressure regulator – Camco make a water pressure regulator that will protect your plumbing in an easy to use way and in a portable product. If you want information like the pressure level (PSI) you can get one like this one from Kanbrook. Water filter – Having a water filter connected to the hose before the water enters your tank or city water connection will help to make sure the water you’re drinking is clean. Camco makes a water filter that is advertised to greatly reduce bad taste, odors, chlorine and sediment in the water you put through it. This is a great product that I have used myself. Some campgrounds or fill-up stations have pretty nasty water and it’s great to be able to filter that water easily.